23 Comments on !!!! !FREE GAME GIVEAWAY!!!! !METRO 2033!!!!! Dont have Metro 2033? Well now is your chance to score a copy of the PC version. 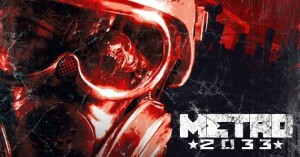 ENTER TO WIN A FREE STEAM COPY OF METRO 2033!!! Articles are worth 2 entries and comments are worth 1 entry, there is no limit so start commenting or writing!!!! The game will be delivered through steam and to streamline that process please include your email address associated with your steam acct with your first post/comment. OH AND JUST FOR CLARITY, THE COMMENTS IN THIS POST ARE ELIGIBLE FOR ENTRIES, JUST CUZ ITS THE ANNOUNCMENT POST DOESNT MEAN ITS INVALID. ANYONE WHO WANTS TO SUBMIT AN ARTICLE BUT DOESNT HAVE THE PERMISSIONS TO SUBMIT THEM ON THE SITE CAN WRITE THE ARTICLE THEN SEND IT TO gamersblg@gmail.com. Hey guys, this was actually the first giveaway, it has since ended. I’m sure a new one will be along shortly. Hi man, I really can’t wait to play metro but I don’t have money to buy it. I have to admit I am writing this purely to enter the competition. However I will thinly disguise it as a worthwhile comment by adding a bit of substance to it. Metro 2033 seems to have a lot of interesting elements to it, and whilst the premise has echoes of various games I feel that utiising bullets for currency, and bullets as a commodity in itself, would be a nice change to the gratuitous, infinite bullet supply of many games I have played. ok well i see the promotions tab and the articles contained in it but nowhere do i see anywhere to post my own article. or do we just leave them as comments or ??? yea they should just toss us tech just for being here. lol. For the promotion just post an article or comment under the promotion section. (PROMOTION tab at top of page) ANY and ALL posts under the promotion section count as an entry for the drawing. where do we post the articles again? Welcome back air… it’s nice to see you around again! what are your hardware specs? basic net isnt so much an issue unless you plan on dominating in online matches. I dont know all the specific details, but I do know that for a company to send you free hardware it has to benefit them financially, so for a review site it would require a site that is highly popular and professional, gets tons of traffic, and is seen world wide. Also it wouldnt surprise me if they wanted free advertising space on your site, either way they would expect a certain ammount of advertising for their cause, and professional advertising at that. So Im not saying that thegamersblog.com isnt professional or trashy, its quite the opposite, it however isnt near as huge as a corporation would like it to be for something like free hardware. Not to mention that they would also likely expect something flashy and commercialized. yea i have a basic pc. basic internet. what kinda implications are we lookin at? I think that was being looked into at some point however the implications of that are many 🙁 do you have a laptop or a basic PC? ima write a few articles up on a couple of games i have played. and maybe some 3d tech i been looking into. i dont have a rig to play this on so hopefully the next promotion you giveaway some tech so i can start building. Maybe u should see if u could get some tech to review hands on from some cool company like nvidia or alienware(prob to much to ask for but hey i can dream right) anyway i will put my srticles up soon. Very cool promotion man, I’m not much for writing but I like what you’re doing here.